– Leave it to William Coles to create another engrossing, shocking, dynamic, and totally addicting story that kept me attached to my kindle for hours on end! I’ve lost track of how many of his books I’ve read now (3 maybe? ), but each seems to be better than the last, and believe me that’s a pretty high bar! This book was creative, well-written, and fast-paced. Loved the character of Hiram McDowell and this may seem random, but I love that he isn’t the stereotypical ‘good guy/hero’ we always read about. He’s definitely shady and of questionable character. Thought his whole storyline with the characters was really original and intelligent and actually brings to light many real issues in life. I always love how Coles writes in a way that we really feel like we are inside the story right from the beginning, and we never want to leave! Coles not only writes well, he isn’t afraid to think outside norm conventions and come up with some pretty outlandish scenarios, but still remain quite believable. This book is a standalone, so there is no cliffhanger here and I loved the ending, even if it’s not ‘happy’. It totally works. Highly recommend for mature readers of literary drama and fiction. (5 stars). – There are few things I enjoy more than curling up with a good book and getting lost for hours on end, and “McDowell” by William H. Coles did a great job of keeping me hostage night after night! It’s fascinating character drama that in a way is very fitting of the genre, but also feels very original at the same time. The circumstances and situations Coles puts his characters in (Hiram, but also the others) are anything but run-of the-mill, yet still maintain a sense of believability. These things, while unusual, DO happen (shootings, hiking accidents, shoddy medical research, jail breaks, etc…) and while it’s unusual to have SO MUCH happen in one book, it’s also what makes it highly entertaining and hard to put down. But it’s not all high-octane drama, there is also the softer, emotional side that was appealing, and some deep philosophical themes throughout. I liked the characters and thought the dialogue seemed natural and helped to move the story forward nicely. Some bouts of ‘telling’, but mostly a fast paced read. An engaging and intelligent book that will surely appeal to mature fans of literary drama. (4-5 stars). 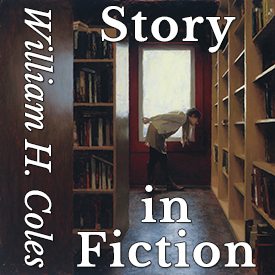 – Another great read from William Coles! This author is quickly becoming one of my dependable “go-to” authors when I need a great book to sink myself into. I found myself reading this one slower than I had his others, simply because I wanted to savor the amazing experience and not rush through it. Fortunately his books tend to be on the longer side, so the story is not rushed at all, yet maintains a quick pace that keeps you reading more and more until the exciting climax at the end. I think that other than Hiram, Sophie was my favorite character, and like McDowell, she shows great development throughout the course of the story. I liked the quirkiness of the supporting characters, too. 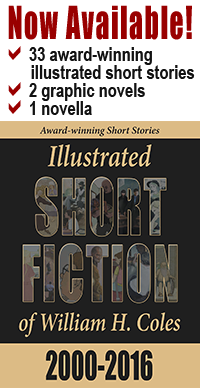 The whole thing felt authentic and the dialogue was natural and flowed off the page. Occasionally I started to feel unsure what exactly the real conflict was…what exactly was driving the story forward, versus things just “happening”. It did become clearer as I read on, and it was only because I’d read this author before did I know I’d get my ‘reward’ at the end. But I still highly recommend this book (and the others Coles has written) and if it’s your first one by him then you are in for a real treat. Sit down, get comfortable, and enjoy the ride. (4 stars).